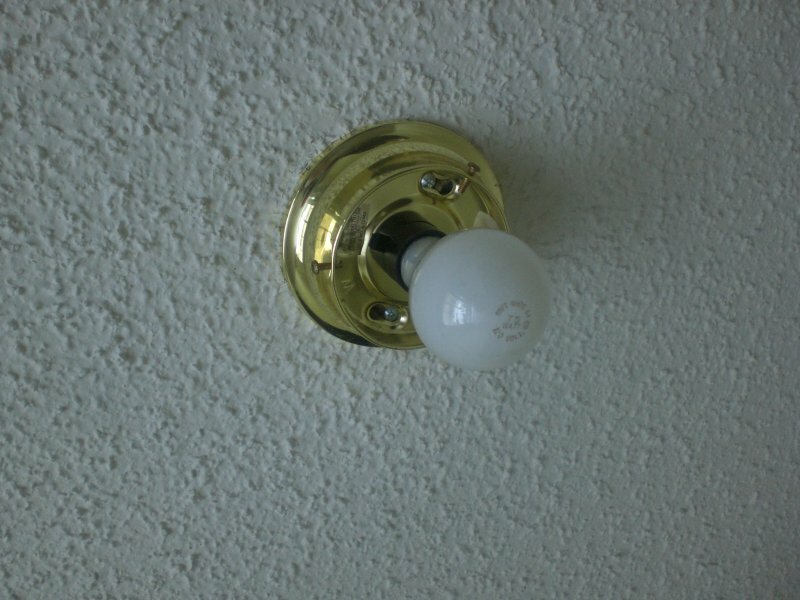 You’ll see in later photos that going from two one-bulb fixtures to two of these made a huge difference. 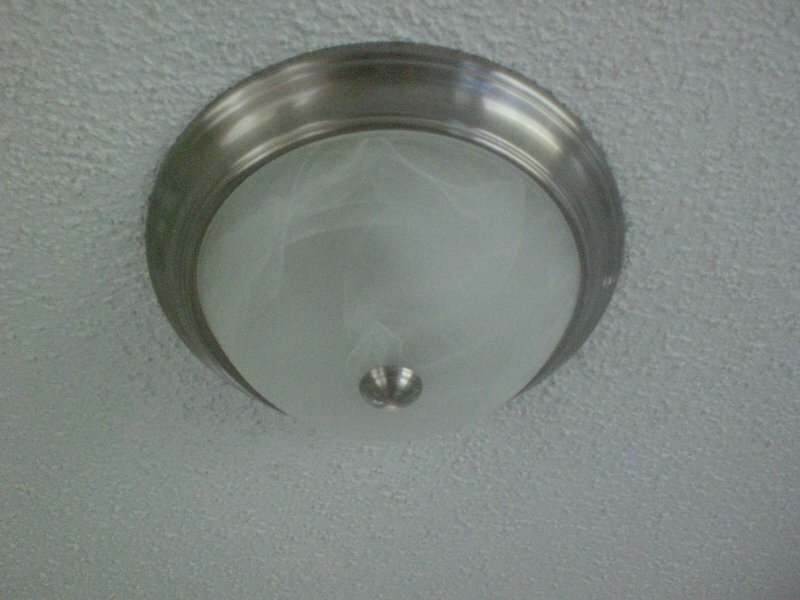 While he was at it, my husband also replaced the dark wooden ceiling fan in the living room with a bright white one. We are fortunate to have a family member who gives us hand-me-down fixtures and home dec items from time to time after a remodel, so we’ve gotten a lot of wonderful pieces we can use in our own home. But you don’t have to have a relative who itches to redo every year to find good bargains! Lowe’s has a wide variety of inexpensive ceiling fans that work nicely for under $50. Once I had good lighting in place, I went ahead and primed the kitchen walls. Because I knew I’d be covering the white linoleum and tiling the countertops, I didn’t have to worry about drips or use dropcloths. I just went at it and got two coats of primer over the striped vinyl “wallpaper” and all the trim. Before refacing the cabinets, I put one coat of latex semi-gloss on the crown moulding over the two coats of primer. All of this took a grand total of three hours over a couple of days (I did other things while the coats were drying). After removing the lower cabinet doors, I washed them all thoroughly with “RedMax,” an industrial-strength degreaser, to remove any food and grease remnants (paint won’t adhere well over those). RedMax is a non-smelly, non-caustic degreaser I found at Lowe’s, and it worked wonders. After the doors had dried, I took my orbital sander with #200 paper in place and roughed up the front surface of each door, as explained in the how-to instructions from Decotime. Finally, I wiped down each door and drawer front with a tack cloth to remove any residue from sanding. Now I was ready to paint! I laid all the cabinet doors out on the countertop with a couple on a dropcloth on the floor when I ran out of room. I stirred the Cabinet Rescue paint, poured it into a small paint tray, then took my high-density foam roller and began. I was amazed at how nicely the first coat went on and pleasantly surprised at how uniform the surface looked when it dried. There were no visible roller marks at all. 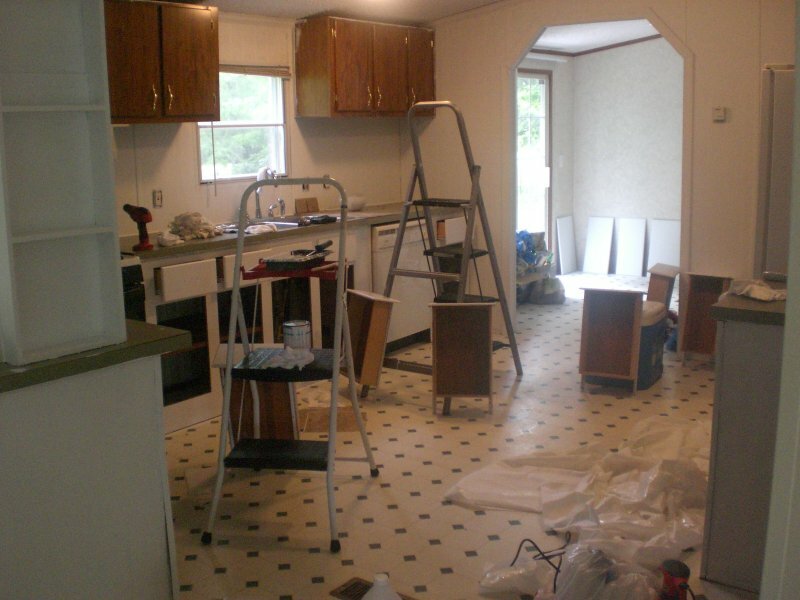 In the picture you see the kitchen in progress. This went amazingly fast. 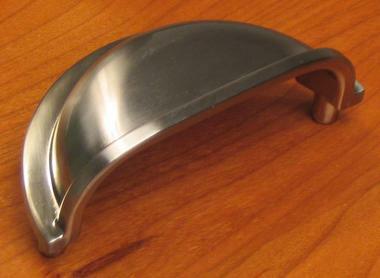 I ended up putting three coats on everything, which created a nice, solid white finish. I found that it is absolutely necessary to let the doors dry flat rather than standing them up to dry. The paint cannot drip when the door is lying flat! I accidentally stood one door up too soon and ended up having to let it dry completely so I could go back and sand off the drips and do it over again. Far better to let things dry thoroughly while flat before moving them. When the lower cabinet doors were dry enough to stand up, I painted the upper cabinet fronts (which my husband had taken down, degreased, and sanded). 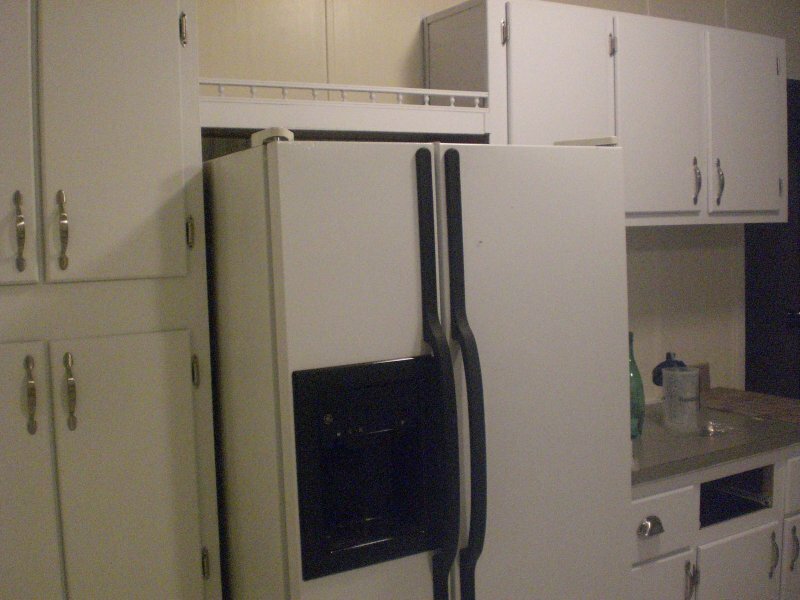 Here you see the cabinet front next to the refrigerator. This is after one coat of Cabinet Rescue. I had to be extra careful to watch for drips on the cabinet fronts, since they obviously have to dry upright. I was fortunate to be able to do all of this refacing work while we were still living in our other house. 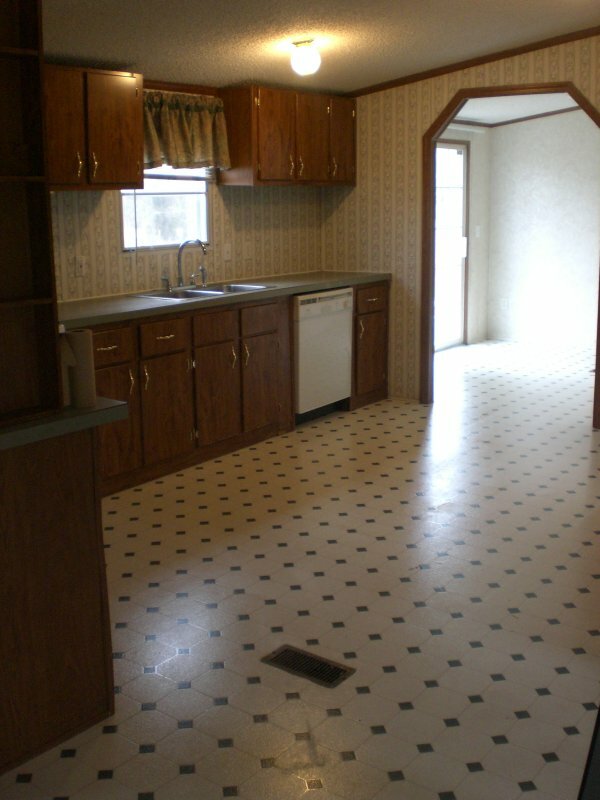 It would have been tough to manage a kitchen re-do while trying to prepare meals! My children enjoyed a lot of time outdoors and played with friends next door as well, which helped. I did most of the work during afternoon naptime while the littlest ones were down and at night after the children had gone to bed (we camped out in the trailer a couple of times and ate picnic-style for breakfast and lunch the following day!). 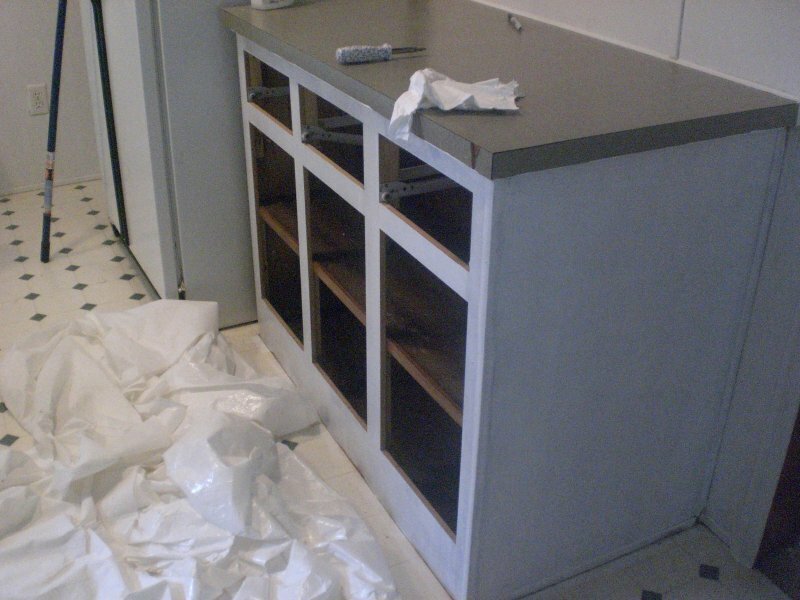 Cabinet Rescue dries very quickly, so it doesn’t take long to get all three coats in place. However, once you have the final coat on, the paint has to dry 72 hours to achieve a hard, chip-resistant surface. This was not a problem, since it took me a week to get back to the trailer and finish up. 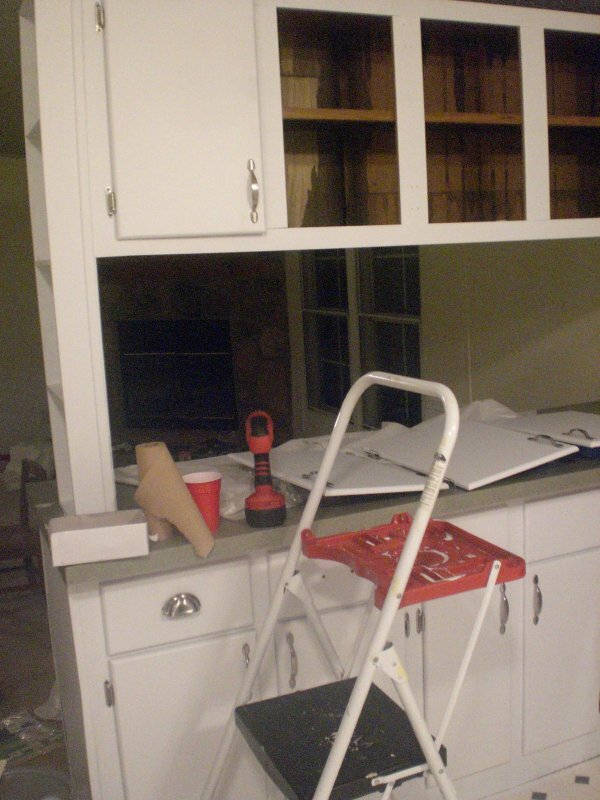 By the time I returned, the paint was smooth and hard, and we were ready to install the new cabinet hardware and rehang the doors. I brought a friend from church with me who spent the afternoon screwing on all the hardware while I went ahead and painted two coats of my buttercream paint on the kitchen walls (taping off the cabinets and trim first). With that color in place, the white cabinets really popped, and we were so excited to see things coming together. At left you can see the first two cabinet pulls in place. The drawer pulls took a little bit of work, since they required a bit of drilling on the drawer fronts for them to lie flush against the surface. The hole that the screw goes in sticks out beyond the edge of the drawer pull, so I simply drilled a shallow hole the same size in the drawer front. When the pull was screwed in place, it lay nice and flat against the drawer front. Once we had all the hardware and hinges attached to the doors, it was time to rehang them. I thought this would be harder than taking them off, but it was actually much easier. I think taking off ten-year-old hinges with rusty screws is a lot harder than going back in with new screws! You can see the lower cabinet doors back in place on the peninsula in this shot, as well as one of the drawers. 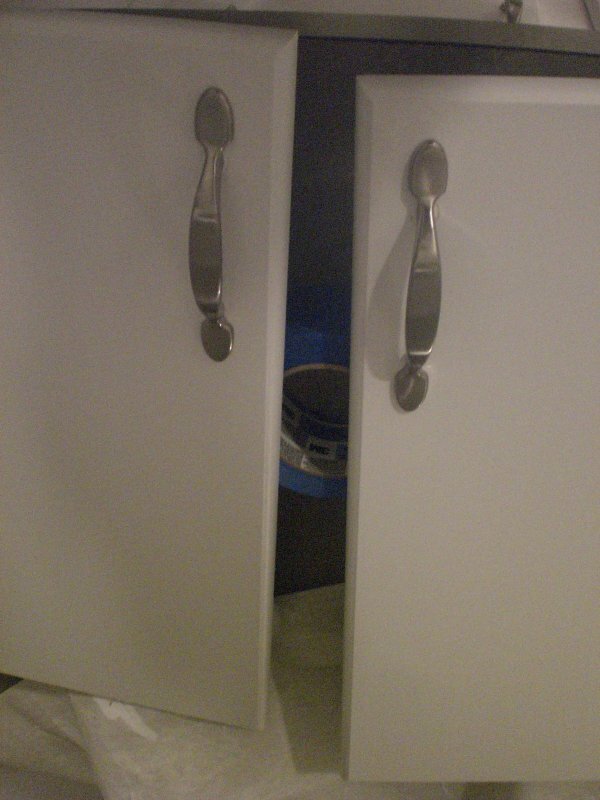 The remaining cabinet doors rest on the countertop below their spots. And that reminds me of a very important point: Before removing them, you want to mark the backs of all your doors and drawers so that you know where they came from! I marked all the upper peninsula doors with “U P 1,” “U P 2,” etc. and all the lower peninsula doors with “L P 1,” “L P 2,” etc. I had a system for each section of cabinets and marked accordingly. The drawers I simply numbered one through nine, starting on the left and going clockwise around the room. I didn’t mark the cabinets with corresponding letters and numbers, trusting that I’d remember what my numbering system meant when I went to replace everything. I only got confused once, and then I was able to figure out where the errant door went by process of elimination! What a change! And the cost for this total cabinet/wall/light fixture makeover? $160.73 (that includes s/h for online purchases). Hard to believe, isn’t it? 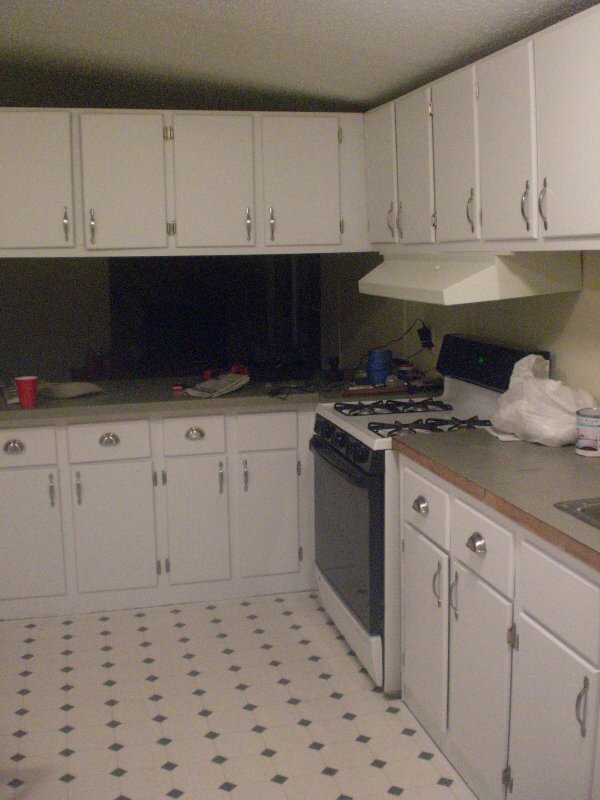 Replacing cabinets would run about $5,000 in a kitchen this size. Having them professionally refaced would be about $2,500. 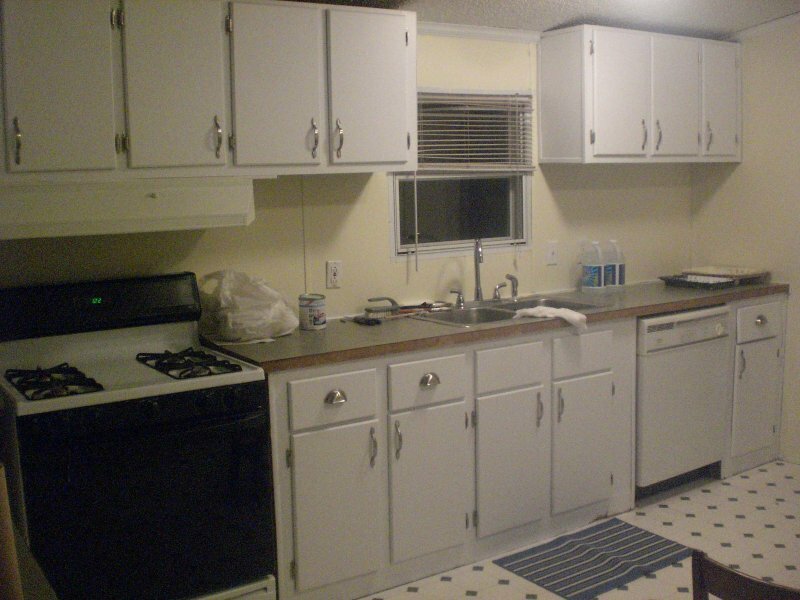 Throw in your own elbow grease, and you can do a total kitchen makeover on the cheap! Next time I’ll show you how we covered the old white linoleum for a totally new, up-to-date look that will stand much more wear and tear!